Each year at the end of the summer (typically mid-October), we organize a one-week summer school at the ICP at Stuttgart University, Germany. The schools are typically free of charge, and in some cases we may even be able to support people from abroad. The schools are sponsored by CECAM and the SimTech Cluster of Excellence at Stuttgart University. Our cecam school Particle-based Simulations for Hard and Soft Matter will take place on October 8-12, 2018 at the Institute for Computational Physics, University of Stuttgart. 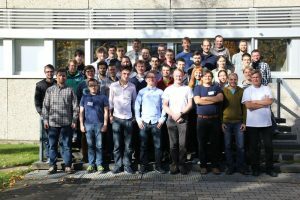 The school focuses on the introduction of particle based coarse-grained Molecular Dynamics simulation techniques for Hard and Soft Matter systems with the freely available software packages ESPResSo and IMD. It is intended to introduce the participants into specific methods like Lattice-Boltzmann, Smooth Particle Hydrodynamics, advanced electrostatic algorithms, force field development, finding optimal transition states, and coarse-grained model building, as well as visualization methods with the program MegaMol. This visualization middleware focuses on GPU-accelerated visualization of particle-based data with the scope of interactive exploratory analysis of molecular dynamics simulations.